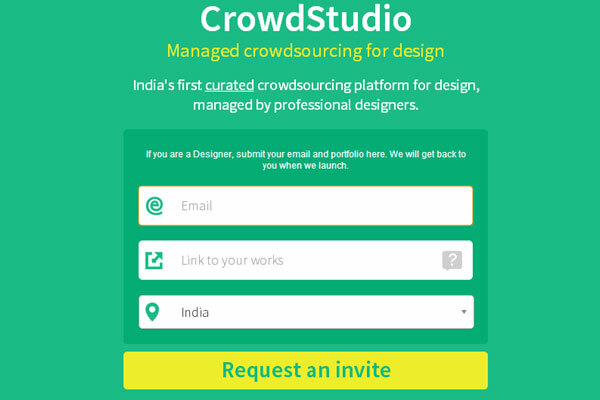 ZeroGravity Technologies LLP, which operates under the brand name WowMakers, has launched CrowStudio.in, an online crowdsourcing platform, where brands/businesses can run a design contest and choose from designs curated by its in-house team. "In the existing platforms, literally anyone can sign up and become a designer. Even though each contest gets more than 50 submissions on an average, most of those are of poor quality. This is because of the lack of a clear-cut curation system in place," said Jaseem Thayal Shareef, co-founder and COO, WowMakers. "In contrast, CrowdStudio brings an innovation here where our in-house panel of experienced professional designers will screen each and every designer before adding it to the platform." If a brand/business wants to get a design, say the company logo, it can visit and register on CrowdStudio.in. The brand needs to provide its requirements and other details. It also needs to pay a fee of Rs 2,000 to launch a design contest on the platform. Once the contest starts, all the designers in the platform start submitting designs based on the brand's design brief. The brand will receive a lot of quality design options. It can send feedback which allows designers to come up with revised designs. The contest will run for a week. Once the contest is over, the client will have to select a winning design. CrowdStudio's in-house panel of designers will also recommend the best designs from the submissions. According to Shareef, curated crowdsouring is different from managed model. "In the managed crowdsourcing, big tasks are broken down into smaller ones by the platform itself and crowdsourced to people with specific skills. In fact, we are working on the open model, but we curate designers and pick up the best ones." Shareef said other similar platforms leave the burden of decision making to the clients, whereas in CrowdStudio, its in-house panel recommends the best submissions to the contest holder (brands/businesses) and help it to choose the winners easily. "CrowdStudio is currently in private beta. The pre-launch sign-up page is already live. As of now, we have received about 500-plus portfolios from designers. The first contest on the platform is being held by ourselves to find out the best suitable logo for the site. The winning design will receive Rs 25,000 cash prize," Shareef said. The company will charge a fee from clients (brands) to list on the website. Besides, it will take a commission from designers, who win the prize. The company also promises 100 per cent money back to the client if it does not get the design it wanted. WowMakers was founded in August 2011 by Shareef, Vivek Raghavan (CEO), Jithesh Lakshman (creative director) and Ralu RM (CMO)—all classmates and hold degree in Computer Science from the College of Engineering at Trikaripur in south Kerala—along with Nithin Bekal (CTO), a BE in Electronics and Communication who they met while working with e-learning startup Foradian Technologies in Bangalore. WowMakers has so far worked with more than 150 clients, majority of who are startups, apart from companies such as Microsoft and BlackBerry. WowMakers is the first company to be incubated at Startup Village, a government-backed startup incubator located in Kochi.